Pie weights are used to keep a pie crust from bubbling and shrinking away from the edge of the pie plate or tart pan when you're blind baking—a fancy term for prebaking—a crust. If you don't own pie weights, there are plenty of things in your pantry that you can use instead. Of course, pie weights aren't completely necessary to make a delicious pie, but if you're someone who pays close attention to detail, or if you're entering your pie in a contest, you want it to be just right. 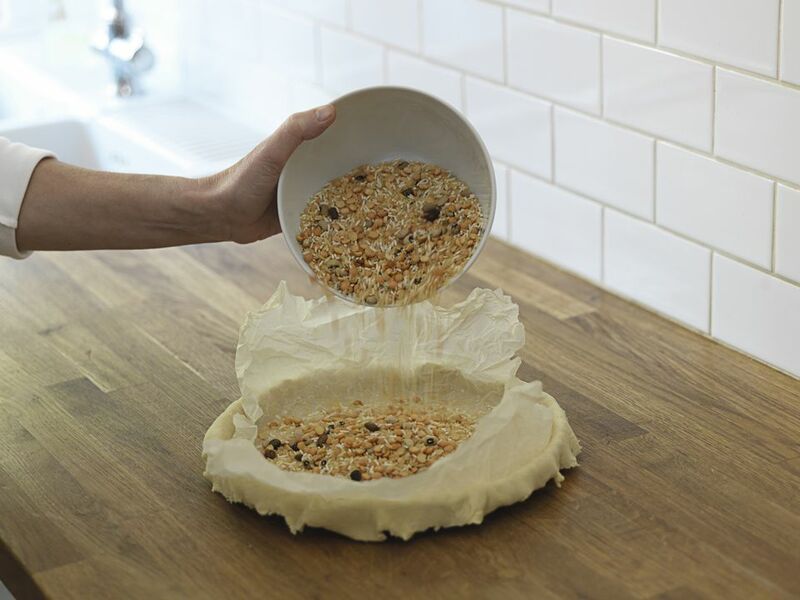 Line the inside of your crust with foil or parchment paper, and fill it with dried beans, rice, or popcorn kernels. Then, bake your crust according to the instructions in the recipe. Your homemade pie weights will probably be too dry to cook and eat afterward, but don't toss them. If you save them in a jar, you can use them the next time you need pie weights. Illustration: Miguel Co. © The Spruce, 2019. You can also weight your crust down by nestling a second pie plate over the top of your crust. If you use this method, spray the bottom of the second pie plate with cooking spray, so it doesn't stick to your crust. Once you have your crust sandwiched between the two plates, carefully flip the whole thing over, and bake your crust upside down on a cookie sheet. This will prevent the crust from shrinking while it bakes. Remove the pie weights or second pie plate halfway through the baking time. Then, dock the crust—poke holes in the crust with a fork—to prevent it from developing bubbles, and return it to the oven. This will ensure that the bottom of the crust gets a chance to cook fully so that it comes out golden and flaky. If you bake pies often, you may find it worthwhile to add a set of pie weights to your drawer of kitchen gadgets. They cost very little and don't take up much space. When you're baking a pie, the edge of the crust tends to bake faster than the rest of the pie or pie crust. To prevent this, you can wrap the edge with aluminum foil to keep it from burning—but the foil will likely fall off when you move the pie. If that's your experience, splurge a bit and buy a pie crust shield, a silicone piece that fits over the crust to protect it from the heat. It's adjustable, so it fits many sizes of pie plates, and unlike the aluminum foil, it stays in place. It will be such a good addition to your baking supplies, you'll probably soon find yourself adding a second one to your collection. And if you're an avid baker, take the time to learn recipes for making your own pumpkin pie spice or apple pie spice. Also, it's worth investigating ingredient substitutions, and save yourself a trip to the store if you run out of an ingredient called for in your recipe. There are even swap-outs for parchment paper if you run out while you're baking.